Are you planning a special event? You gather the guests-Avalare Strings will supply the ambiance! 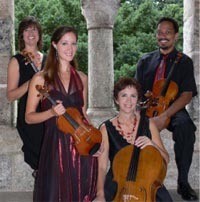 Avalare Strings performs for corporate events, private parties, reunions and weddings. Enhance the atmosphere of your special event with exquisite artistry. Employing the full rich sound of a string quartet, Avalare Strings guarantees high quality performance and professionalism.